On day four of our epic week of hunting, after traveling all over the great state of Idaho, Shawn and I felt lazy and wanted to sleep in . . . until 7:30 a.m. (which is sleeping in for this crazy Bird Brain). We decided to eat a good hot breakfast and hunt close to home. 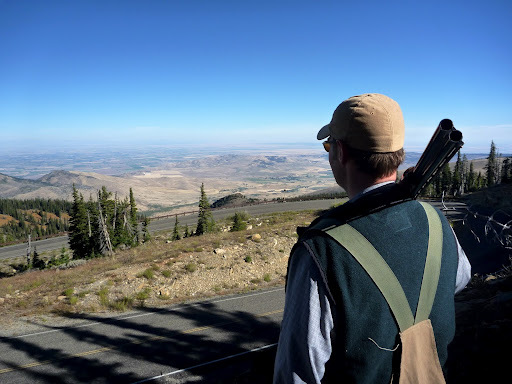 Shawn was so impressed with the blue grouse cover we hunted on day one of the hunt (see “Of Whiffers and Cliff Divers” below), that he was willing to try it again. Of course, there was no complaint from me as the blue grouse is my favorite game bird. I love the beautiful alpine settings they inhabit and the challenge they so often present on the wing. A big male blue and Shawn’s 28 Gauge Ruger Red Label O/U. At around 8:30 a.m., we stopped at our favorite truck-stop restaurant just off of I-84, fittingly dubbed, “The Wayside Café.” Every time I eat there—sometimes as early as 5:00 a.m. in the morning―I can’t help but think of the symbolism of that name. For the phrase the “wayside” has often been considered negatively as a place where lost or fallen souls have strayed–somewhere off of the strait and narrow path. Usually, early in the morning there are only fry cooks, groggy waitresses, truckers, and—when we are there―occasionally bird hunters. Admittedly, bird hunters are an eccentric lot and some may think of us as wayward. 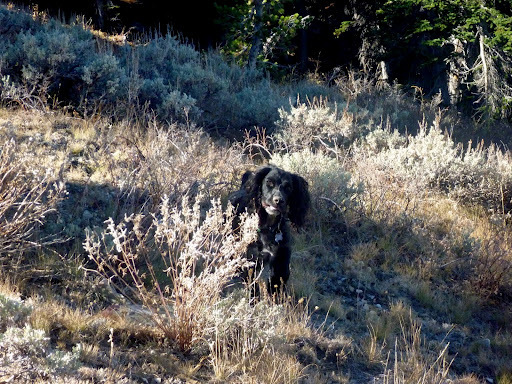 However, on a sunny, October day before a grouse hunt, we feel anything but lost or fallen. After breakfast, we headed towards the mountain looming in the distance. 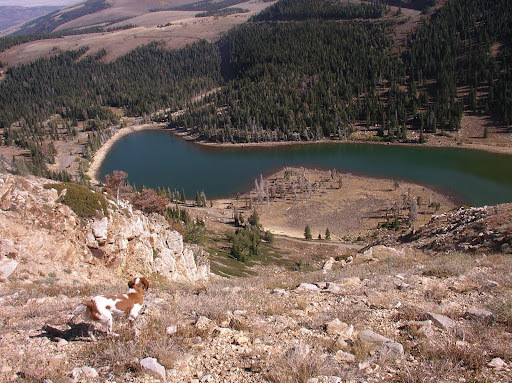 The short drive took us from irrigated desert farm land to a mountain peak 10,000 feet above sea level. Misty enjoys the view at 10,000 feet. “Believe it or not, I have seen sage grouse up here only 100 feet from where I’ve found blue grouse.” I reported matter-of-factly to Shawn. “Are you kidding me?” Shawn asked as we drove across the flat mountain top. As if on cue, we both observed something standing in the roadway. “What is that?” Shawn asked. “That, my friend, is a sage grouse!” I exclaimed excitedly. 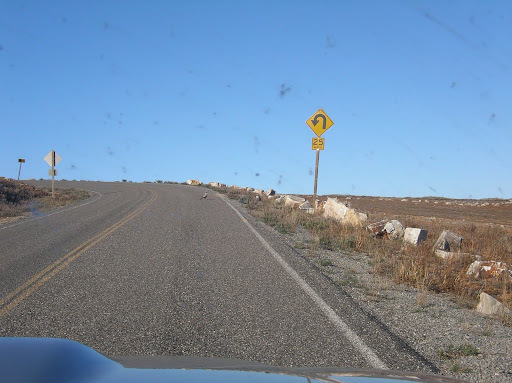 We stopped and took a quick picture and, after we tried to get a little closer, a flock of 5 to 8 birds flushed from the sage brush flying hard and far. 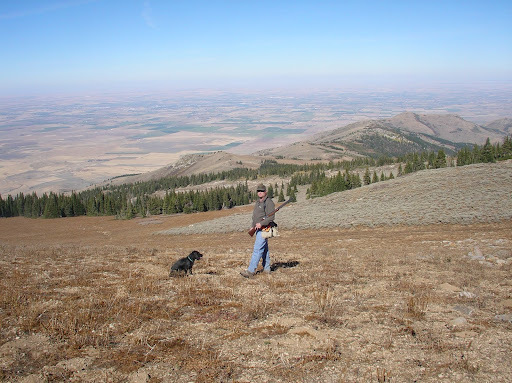 There used to be a hunting season for sage grouse in this area, but the birds in Southern Idaho have not fared so well and—with them almost being listed as endangered last year―Idaho Fish and Game closed the season in certain areas of Idaho. While I love to hunt these big grouse, just seeing them and knowing that they are there is special in and of itself. After much struggle and deliberation, I decided to only hunt my pup, Misty, as my French Brittany, Sunny, could hardly walk after three days of hard hunting. As we walked towards the cover, Sunny girl cried from the kennel in betrayal as we walked into the timber. A tear welled up in my eye as I contemplated her aging and limitations along with her undying desire to hunt. “It’s for her own good, Andy. You’ve got to take it easy on her if you want to keep her around a few more years.” Shawn stated to console my inner struggle. Misty, my Brittany pup, is on her own today. Shawn decided to hunt his fiery, Field Bred Cocker, Ellie. Ellie is black as coal, but she has hellfire in her eyes and she is a real terror on birds. I like to call her “Billy Jean King Bird Buster” which is a play on words of one of many of Chevy Chase’s funny characters in the movie, Fletch. Billy Jean King Bird Buster (Ellie). 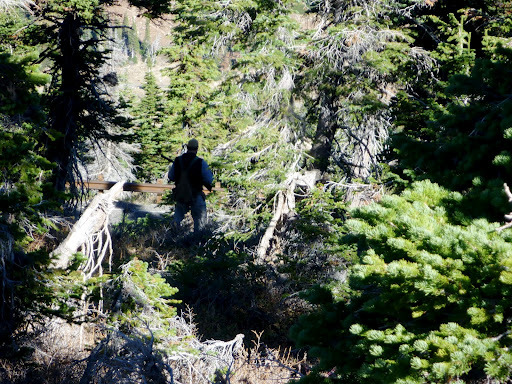 Our first hunt was in a patch of pine trees which is divided into thin sections by the switchback road we had just traveled up. We call this patch “The Piney Strip.” If you recall, this is where Shawn—after going 7 for 7 on blue grouse earlier that year―whiffed the easiest shot anyone can imagine. Every hunter has days like that. Little did I know that mine was coming—even at the door. While we pushed through the Piney Strip, the sunlight pierced through the trees illuminating the open areas, but creating harsh shadows in others. “The birds like to hang out right along this edge and bail over the road when flushed.” I pointed out to Shawn. As we walked, I spied a big blue grouse standing in the shadow of the trees right along the edge overlooking the road as I had just described to Shawn. “Brother, there is a bird right over here. I’m going to go get him. Back me up.” My heart pounded as I approached where I had just seen the bird. Just as I had predicted, the bird dived over the road and I missed him twice. During my fruitless barrage, Shawn also shot. Andy approaches the bird in the shadows. “There were two blues, Andy and I got one of them.” Not only did Shawn see me poke holes into the air, but he made an easy shot to rub it in. Needless to say, I was feeling a bit embarrassed and self-conscious by my poor shooting. Charley Waterman wrote in Hunting Upland Birds: “I seldom hit a bird I can see before it flies.” I have that same problem and that’s my excuse for this miss. However, I sometimes struggle to hit birds even when I don’t see them before they flush. So this excuse only goes so far. 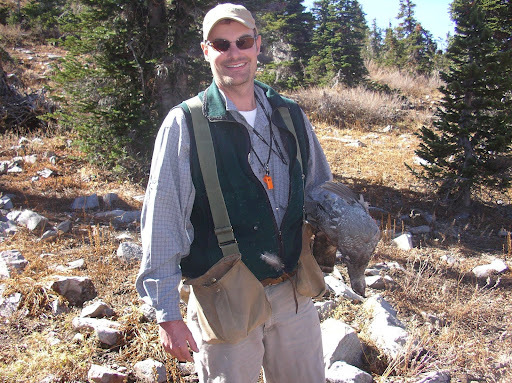 Shawn figuratively wipes my eye with his blue grouse. After we pushed through to the end of the Piney Strip, Shawn decided to hunt downhill and I worked my way back up the edge of the south-facing cliff to the mountain peak. 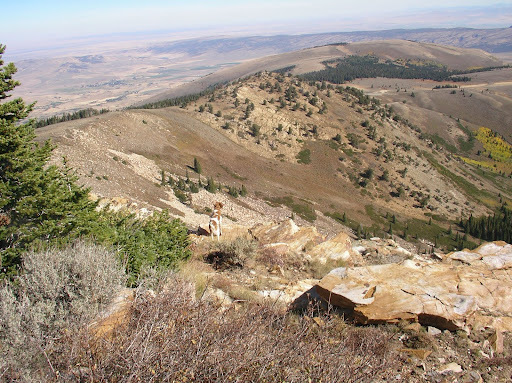 Above the timberline was a small strip of sage brush which was adjacent to a cliff that dropped a thousand feet below. Right after Misty and I stepped into the sage, a blue grouse flushed presenting me with an easy left to right crossing shot, which I missed twice. In my defense, when I shot I was concerned it might be a sage grouse (good excuse, eh?). As if the miss were not bad enough, the bird landed in a slag pile not twenty feet from my position in plain view. By this time I was shaking like Jo Jo the Idiot Circus Boy and fumbled in my vest for more shells to reload. I jammed two shells into the breached over and under and to my consternation, one of the shells sunk below the receiver such that the gun could not close. All the while, the big blue grouse stood there gawking at me. In order to get the shell unjammed, I had to pull my keys out of my pocket and use a thick car key as a lever of sorts to pry out the shell. 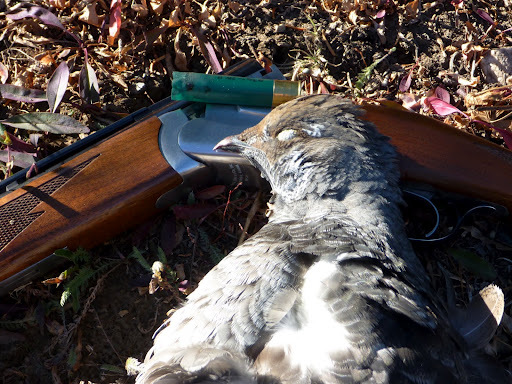 Once this was done, I snapped the gun shut, stepped toward the docile bird, and it flushed like gang busters. Of course, I whiffed two more relatively easy shots in succession. Arggh!!! I just missed the same bird four times (and this was after my two barrel salute to the bird earlier that morning). Misty promptly bumped another grouse that kamikazied off the cliff. By this time, Shawn was wondering what all of the shooting was about and made his way up to my position. The lucky blue had lit into the thickest, gnarliest pine tangles I have ever seen. I sent Shawn into the thick stuff while I stopped to answer the call of nature. Two seconds later I heard a flush, located the bird coming right over my head, turned around for the straightaway and once again, missed him cleanly twice as he blazed across the opening in the trees in which I stood. “I missed that bird SIX TIMES!” I groaned in agony. Earlier that week, I had experienced some of the best shooting of my life and now I was experiencing a terrible slump. “That’s a tough shot for anyone.” Shawn sympathized. True, the last two shots were tough, but I had no excuses for the others. No two ways about it, I was just stinking up the joint with my poor shooting and I felt as if I had fallen from grace. Shawn and I walked together back towards the truck just talking and not really expecting anything when a flushing blue grouse caught us both by surprise. We both fired and missed on the first shots, but on my second, it came down. “Did you shoot ?” I asked incredulously, not believing that I had hit the bird. “Yes, but I missed him,” Shawn replied. “I was just about to pull the trigger again when he dropped. You got him, Andy. Good shot!” Ellie made a nice retrieve. “Man, it’s good to get the monkey off my back!” I exclaimed jubilantly. It’s funny how you can have the absolute worst day of shooting and feel like you’ll never hit one again―even if your life depended on it. And then, when you are not even thinking about it, you instinctively make a good shot and the day suddenly changes from despair to joy. Not meaning to be sacrilegious, it’s almost like a little taste of redemption. Indeed, bird hunting (like life) is a roller coaster ride, an endless series of peaks and valleys. We never know what will happen on any given day afield, but this uncertainty and excitement is what keeps us coming back for more. And when we finally succeed, it makes the experience sweet. Andy, with one less monkey on his back. 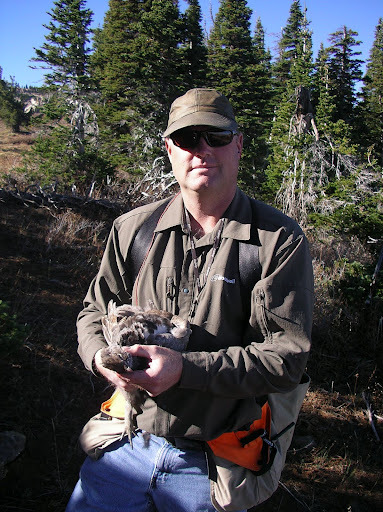 After basking in the autumn sun and eating lunch, Shawn and I hunted the north facing slope, but found no grouse. “Let’s try one more place. There are these little patches of timber along this stair-stepping, series of cliffs where I have found birds before.“ I then told Shawn about a time while deer hunting in a blizzard in this very spot when blues dove out of their snowy roosts in the pine trees off the sheer cliff, scaring me nearly to death. “Okay,” I reluctantly agreed. Shawn’s whining turned out to be a blessing because as soon as we made the turn, Misty flushed a blue, and I snapped at it on the rise breaking a wing. 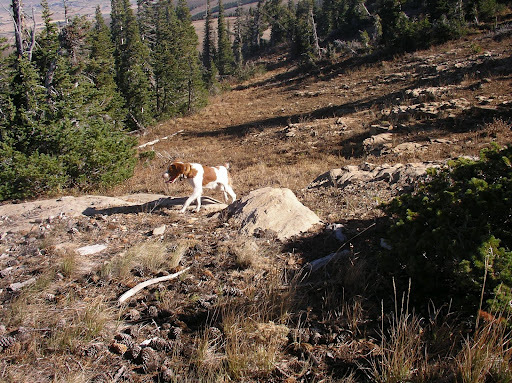 Misty pursued the running grouse downhill and, in the process, flushed another one while I reloaded. “You’ve got to be kidding me!” Shawn hollered from down below me. The excited puppy pursued the winged grouse sixty yards down the hill and pinned it with her paws until I could catch up and bring the bird to hand, another huge male, half the size of the pup. As we hiked back down towards the truck, Misty flushed one more bird, which presented no shot. “Aren’t you glad I am a wuss?” Shawn asked with a huge grin. “If I hadn’t complained when I did, Misty would not have found those birds. Misty is going to be a good bird dog, Brother.” I felt great pride in her performance and, despite my earlier abysmal shooting, felt great satisfaction from the end results of the hunt.